"I know how to communicate ideas - that's really why I win." 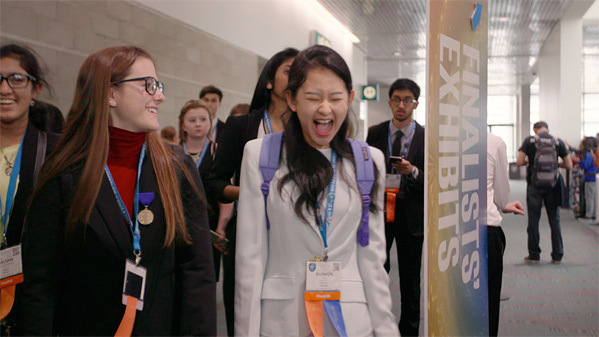 A trailer has debuted for a documentary titled Science Fair, premiering at the Sundance Film Festival - which kicks off today in Park City, Utah. As the title indicates, this is a doc about going to the big "science fair" - specifically the Intel International Science and Engineering Fair (or Intel ISEF). The film profiles nine different high school students from all around the world who must "navigate rivalries, setbacks, and hormones on their quest to win the international science fair. Only one can be named 'Best in Fair.'" This looks like a very fun, inspiring, enjoyable look at the world of science fairs. It reminds me of October Sky, one of my favorite films involving a science fair. I'm most interested to see the kids from foreign countries who make it in, seems like that's the bigger challenge. From the Sundance guide: "Science Fair follows one mentor and nine students from around the world as they prepare their projects and team for the 2017 ISEF event in Los Angeles. Though all are participating for the love of science, we also learn that there are other underlying influences motivating them to pursue their dreams of participating in the competition. Featuring interviews with the charming young scientists, their parents and mentors, as well as past ISEF winners, this absorbing film illuminates a group of amazing young men and women who are on a path to change the world through science." Science Fair is directed by newcomer filmmakers Cristina Costantini & Darren Foster, both making their feature debut with this doc. The film is premiering at the 2018 Sundance Film Festival this month in the Kids category. Science Fair is still searching for a distributor and doesn't have any official release set. Stay tuned for more. Interested?